Have you ever dreamt of living in a spacious and comfortable riverside home with stunning views, nearby coastal walks and easy access to Britain's Ocean City of Plymouth? Well here is one available right now. After being motored here under its own steam a couple of years ago, this Dutch Barge has been tastefully converted into a beautiful home. Currently berthed on a riverside mooring in a beautiful estuary in Cornwall near to Plymouth, she provides a safe haven to live and relax, full time, part time or just during your holiday time. The spacious accommodation with great head room throughout has a light and airy feel to it, whilst also feeling private, secure and cozy. It comes with all the mod cons of modern living, the fully fitted kitchen is very well equipped with a large cooking range, plenty of worktop space / storage and the large fridge/freezer, washing machine and dryer are also included. There are two large double bedrooms / cabins, one with its own bath. The accommodation is well insulated with central heating and the open plan saloon / sitting room has a large gas flame wood effect burner. With a good hull survey from 2015, a working engine, a generator and a huge holding tank, this vessel could be moved by sea to another location or enjoyed exactly where she is. What are you waiting for?! 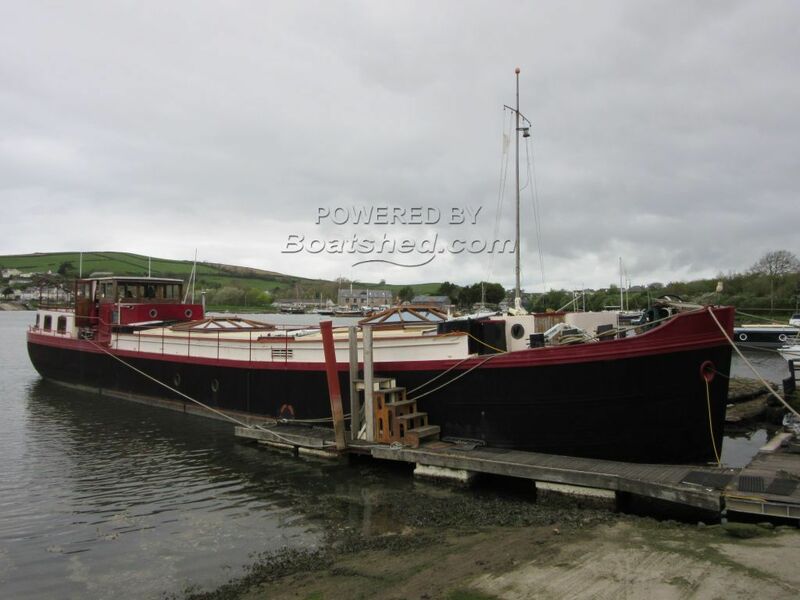 This Dutch Barge 97ft Motorspits has been personally photographed and viewed by Billy & Jo Hallam of Boatshed Plymouth. Click here for contact details.